Born and raised in one of the oldest parts of Kyoto, Emiko Toda Loeb originally studied piano, but after emigrating to the US in 1977 she concluded that music was not for her. After several years of searching for her new artistic outlet she found her passion in quilting. Her works uniquely blend Japanese and Western sensitivities. Her works often include antique Japanese fabrics, sometimes in unusual juxtaposition with fabrics from many other countries, often obtained during travels. She has achieved a high degree of international recognition for extensively developing the techniques of reversible Log Cabin quilts, and has used these techniques in a large number of greatly varied and complex pieces which comprise slightly more than half of her output. In addition to her regular yearly schedule of classes in Japan and the US, she has also taught in Australia, Korea, New Zealand, Switzerland, and Taiwan. 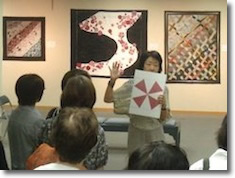 Traveling back and forth between the US and Japan three times per year, she established the New Zephyrs quilt group in Japan in 2001 with more than 80 members. They present annual exhibitions in Tokyo and Kyoto based on a different theme each year, and occasionally in other locations (Yamagata, Matsumoto). 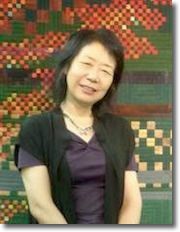 She has published two books in Japan, and her works appear frequently in quilt magazines throughout the world. She has often served as a judge for quilt competitions.